"The United States seemed to give up acquiring more land during and after World War II. They didn't get any in Europe and let the Philippines become independent. In fact, most of Asia gained independence. With the idea of Manifest Destiny behind us, you have to wonder what went through John F. Kennedy's mind when he suggested the formation of the Peace Corps. Did he think that sending out thousands of young, bright Americans would allow the islands to become a legitimate part of the United States?" "The strange thing about the Peace Corps involvement with the islands is that they never seemed to push the American flag on the people. In fact, there is evidence that says just the opposite. It was the Peace Corps members who worked hard to convey to the islanders the idea of being independent. Or, in Saipan's case, the idea of a Commonwealth with the United States. I don't know what the history books will say about all this, but it was my conclusion that Peace Corps volunteers, imbued with the idea of freedom and independence, brought both to Micronesia. Hooray for them. I'm pretty sure that this is what happened in Palau, as well as other places. I would like to know how JFK felt about all this." Read more. Peace Corps Deputy Director Jody K. Olsen traveled through the Federated States of Micronesia (FSM) from March 26 – 30 to meet with Volunteers, staff, and government officials. Olsen said, “I came to thank our Volunteers, staff and local partners for their dedication to serving others. I am proud of our 40-year partnership in the Federated States of Micronesia and the Republic of Palau. Since we began in 1966, over 3,000 Peace Corps Volunteers have been dedicated to serving in many fields to improve the lives of Micronesians.“ Peace Corps entered the Federated States of Micronesia (FSM) in 1966 when it was still part of the Trust Territory of the Pacific Islands. There are presently 47 Peace Corps Volunteers working with partner agencies in Micronesia. The first group of Volunteers taught English at all education levels. In the 1970s, Peace Corps moved into agriculture, health, and community development. In the 1980s, Volunteers worked mainly in sanitation, forestry, and fisheries. From 2000 to 2005, Volunteers worked on natural resources conservation, community building, and youth development. From 2006 to the present, Volunteers focus primarily on teaching English. Jody Olsen, Deputy Director of the Peace Corps appointed by President George W. Bush, served as a Peace Corps Volunteer in Tunisia. Read more. Caption: (Rt. to Lft.) Deputy Director Jody K. Olsen in a photo during her meeting with Micronesian President Joseph Urusemal and Country Director David Reside. Micronesia’s first Peace Corps Volunteers country director, John Pincetich, was honored at the Governor’s Office for his long and dedicated services to the organization when its headquarters was located on Saipan from 1966 until 1978. Pincetich came to Saipan in the fall of 1966 when more than several hundred Peace Corps volunteers arrived in Micronesia for the first time. Micronesia at the time was under the U.S. Trust Territory administration before the islands all went their separate ways politically, beginning with the Northern Marianas in 1976. 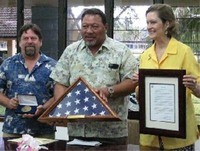 Kurt Barnes, who came to Saipan with the third group in 1966, accepted the plaque presented by Governor Benigno R. Fitial and Lieutenant Governor Tim P. Villagomez. The plaque together with a joint legislative resolution will be sent to Pincetich in the U.S., who will be celebrating his 90th birthday September 14th. “Being in a unique position of directing hundreds of outspoken sixties-era volunteers in a place under the American flag required John to use all his skills of diplomacy,” Fitial said of Pincetich. “He was a great friend of our people as well as of the many Peace Corps Volunteers that he influenced.” Read more. The year was 1970. The Vietnam conflict was being fought by guerilla fighters in the jungles of Southeast Asia. That same year, Cecilia Hartmann of Paterson graduated from Seton Hall University in South Orange with a desire to do something positive. So she joined the Peace Corps. "I wanted to go to Vietnam, but it was off limits," says Hartmann, 61. "I wanted to work with children." Instead, in 1971, she was sent to Chuuk, a remote island that is the most populous of the four states making up the Federated States of Micronesia. Hartmann now calls Chuuk home, and for the past 25 years she has been teaching school there. Life was primitive on the lush island bathed by intense tropical sun. Hartmann's mistake was failing to wear sunglasses as protection from the harmful ultraviolet rays. About two years ago, her vision started to blur due to cataracts. The condition deteriorated to the point where she needed an operation not available in Micronesia. She did research on the Internet and returned home to Paterson to stay with her sister and mother. In May, a surgeon at PBI Regional Medical Center in Passaic performed operations on both eyes. She returned to Chuuk in July with perfect vision. After her arrival, Hartmann soon learned her assignment was among the most difficult for Peace Corps workers because the Pacific island is so secluded. At that time, only three flights a week landed there and only an occasional ship. It had no electricity, roads or running water. The only American on the island, she was housed with a family with 10 children. Although English is the second language, Chuukese is the difficult mother language. Despite linguistic difficulties and the huge adjustment of living in a two-room, wood-and-aluminum-roofed shack, Hartmann decided to stay beyond her initial two-year commitment. Hartmann says she liked teaching in a much simpler environment. "I was going to stay anyway because I liked it, but then I met my husband, who was a descendant of some of the early German traders," Hartmann says. Hartmann calls the natural beauty of the island alluring. "My heart is on the island," she says. Read more. 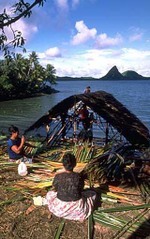 Read more about Peace Corps Micronesia.